I went down to the Lower East Side to watch the Turkish Day Parade. It never happened. No parade. No sign of a parade. I have to figure out how to find a reliable source for parade information. 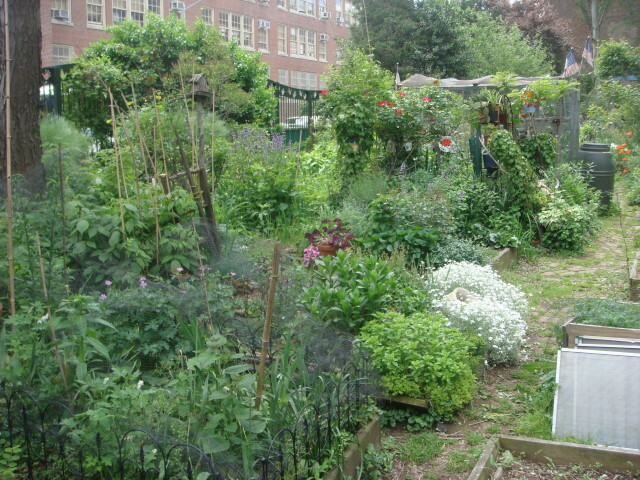 While I was there, looking in vain, I noticed a little garden that I hadn’t seen before. 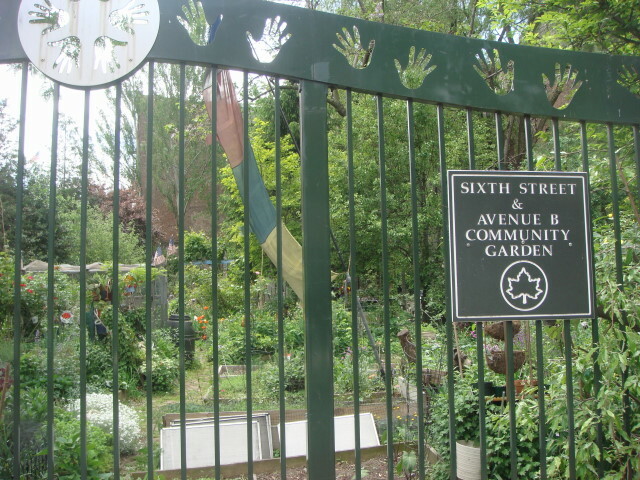 It was the Sixth Street and Ave B Community Garden. Located…right there. 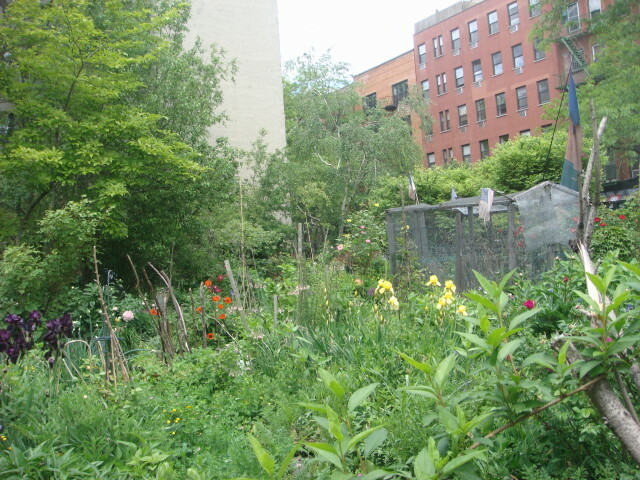 The LES has a whole bunch of these little garden areas. This one was interesting in that it was absolutely busting out with plant life. There was an entire crew in there that day, but I didn’t see any pruning; just heard some stuff about composting which I presumed was neighborhood composting. Look at this place. Looks like it needs a crew with weedwhackers. It’s Spring and the place is roaring back to life after a hard Winter. A little pruning might be a very good thing. Actually, at least one area looked like it was getting ready for some specialized planting. It was this garden that really showed me how vibrant these gardens can be. I went through a number of them during my winter wanderings and am looking forward to seeing how they are faring. Are they tightly managed and kept in check? Or are is each just an oasis of wildness? 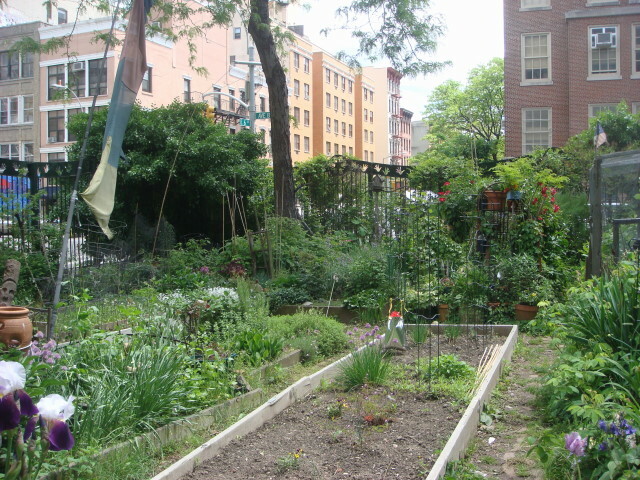 This entry was posted on June 2, 2008 at 7:15 pm and is filed under Greenwich Village, LES, Manhattan, Wanderings. You can subscribe via RSS 2.0 feed to this post's comments. You can comment below, or link to this permanent URL from your own site.